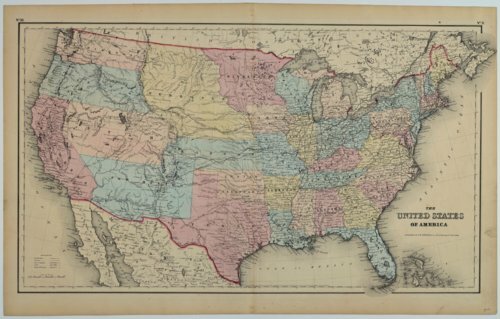 A detailed map of the United States of America identifying railroads, rivers, mountains, bodies of water, cities, states, and territories. Kansas is shown in its large territorial size which included much of Colorado. Population statistics on the back of the map include nativities of the free colored population in each state and the ages of the slave population in several states. This map is provided through a co-operative project between the Lecompton Historical Society and the Kansas Historical Society. Partial funding was provided by the Ross and Margaret Wulfkuhle Charitable Trust and the Freedom's Frontier National Heritage Area.